The Fiskars axe and knife sharpener is one of best sharpeners I have ever owned. The great thing about this sharpener is that it can be used for an axe or a knife, making it an awesome multipurpose tool. Each year, we burn about 10 cords of firewood in our outdoor wood furnace to heat our home. After years of swinging a bulky, heavy splitting maul I decided to purchase the highly recommended Fiskars X27 splitting axe. When I first picked up the X27 splitting axe I was a little skeptical. Could such a lightweight axe really split firewood better than a maul? Well, the answer is yes.....A LOT better. After purchasing the axe I was excited to try it out...kind of like a kid getting a new toy! I immediately went out and set up a piece a wood on the splitting block and gave my new axe a swing. My first swing with the axe split the wood in half with no problem. In fact, a one strike split is very common with this axe. One feature that makes it work so well is the razor sharp edge. The sharpener works great for keeping the edge sharp on my splitting axe so I figured I would try it out on a few pairing knives in our kitchen. After cleaning the sharpener (which is really easy) I ran a few knives through it. My wife will agree that our knives are shaper than they have ever been. Before we knew it we were both sharpening almost every knife in the drawer. Sharpening is easy....just roll the knife back and forth for a minute or two and you're done. 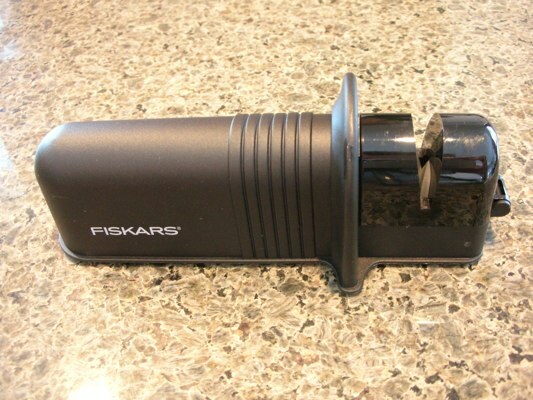 The Fiskars axe and knife sharpener is really easy to use. You just roll the knife back and forth and the preset 30 degree angle does the rest. The sturdy design and hand guard keeps your fingers away from the blade to prevent an accidental mistake. "You could spend countless hours swiping blades over a try-hone stone set, laboriously putting an edge back on your favorite cutting tools. Or you could just give your blades a few effortless swipes with this sharpener and get on with your day. The ceramic roller sharpens at a precise 30 degrees so there's no guesswork. And the safety guard means your fingers are never in harm's way." The sharpener worked so well on the axe and kitchen knives that I decided to touch up my old deer knife. The knife is old and it was passed down to me from my dad. In the past I could get an okay edge on the knife but it was never anything to brag about. After just a few minutes of sharpening the old knife was sharp.....really sharp. I took the knife to deer camp and by the end of the day two guys were asking how I got the knife so sharp. I told them about the Fiskars axe and knife sharpener and they both made plans to buy one for themselves. 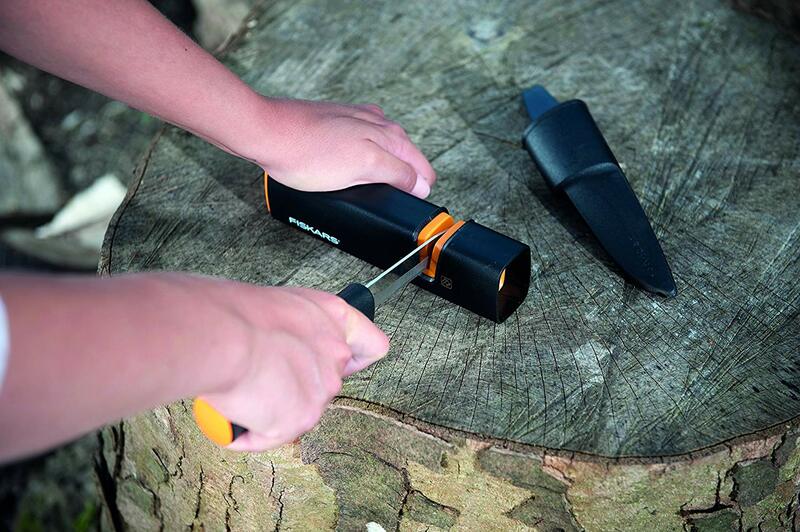 Fiskars now offers the Xsharp Axe and Knife Sharpener which is a newer version of the model. While it will sharpen knives, it works amazing on hatchets and axes! Are there other knife sharpeners on the market that can perform just as well? Probably, but the low cost and user friendly performance from this sharpener definitely makes it something to consider.